(BTO) NuTAP-311, Network x 2, Monitor x 2-Xtramus Technologies Co. Ltd.
NuTAP-311 is a portable network TAP device. Embedded with 2 Network Ports and 2 Monitor Ports, NuTAP-311 can monitor and redirect any data streams flowing through it. Network TAP is a hardware device/software that allows monitoring data flows in a network environment dynamically without any interference. As mentioned above, NuTAP-311 is embedded with 2 Network Ports and is capable of monitoring all data flows between two network points. All data traffic flows between NuTAP-311's Network Port A0 and A1 can be brought out for further analysis and research dynamically and without intervening network environment. 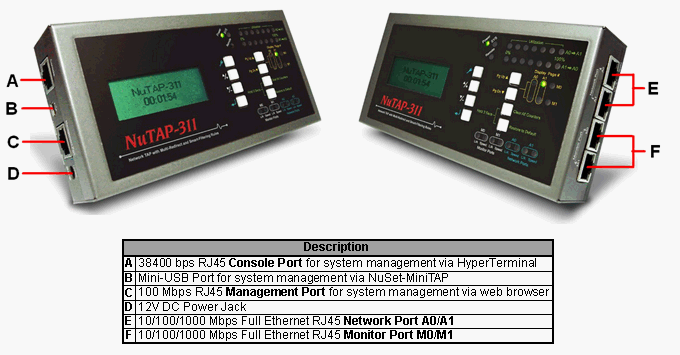 NuTAP-311 is embedded with 4 Configuration Buttons and 4 Operation Buttons, allowing users to configure test criteria and make NuTAP-311 system settings. Also, the LCD screen located on NuTAP-311's front panel makes it easy to view test statistics and system information easily. Also, you can configure test criteria and make NuTAP-311 system settings with Web Browser (by connecting NuTAP-311's Management Port to a network where a PC is located), HyperTerminal (by connecting NuTAP-311's Console Port to PC's Serial Port via a RJ45-to-USB cable), and NuSet-MiniTAP (by connecting NuTAP-311's Mini-USB Port with PC's USB Port). NuTAP-311 is a compact, lightweight, and highly cost-effective device that provides 3 different filters for users to choose: Forwarding Filter, Re-Direct Filter, and Capture Criteria. All these filters are powered by Xtramus SDFR (Self-Discover Filtering Rules), which makes packet capturing/filtering over Ethernet easy and convenient. All packets transferring between Network Port A0 and A1 that meet filter criteria will be filtered out or let through. All packets transferring between Network Port A0 and A1 that meet filter criteria will be re-directed to the Monitor Port(s). All packets transferring between Network Port A0 and A1 that meet filter criteria will be captured and stored in NuTAP-311's memory buffer. All packets transferring between Network Port A0 and A1 that meet filter criteria will be filtered and stored in NuTAP-311's memory buffer. System will stop storing new data once the memory buffer is full. All packets transferring between Network Port A0 and A1 that meet filter criteria will be filtered and stored in NuTAP-311's memory buffer. System will keep overwriting old data with new data.